Deb's Cup of Tea: Define "funny". On the 11th, I tossed a load of wash in the machine, turned it on and let it go. When it got to the spin cycle, the most horrible noise came from the basement. I dashed down there and the machine was "walking" around its corner of the basement, rubbing up against the wash tubs. If you've never seen a washing machine move about, it's not a pleasant sight. I recognized that the load was unbalanced so I opened the top and immediately got the very annoying beeping with the "unbalanced" light. Yes, I know it's unbalanced. I'm going to fix it. Yes, I said this. Out loud. To the washing machine. It was just darks with several pair of pants, nothing really heavy that could, to my mind, cause an "unbalanced" reading. But, physics being what it is, I rearranged everything, closed the top and waited. The machine went into "walk mode" after about 10 seconds. There was a "clunk" this time, too. I grabbed the front of the machine and put all my weight on it. That kept the vibrations to a minimum until the spin cycle was complete. I mashed my left hand's index finger between the washer and the laundry tubs which resulted in a nice bruise. Now, I was rather scared by this. I do not, in any way, shape or form, have the means to purchase a new washer. And removing the old one will be problematic as that means a cleaning of the section of basement where the machine sits, not that I shouldn't do that anyway, but that's beside the point. What will I do if the machine, which is, admittedly 10 years old, dies. Hand washing is something I do know how to do. I let the washer sit until the weekend and then I moved it around and shoved it back into the corner where it belongs. I put in a small load. It was fine. I have since worked my way up to medium-size loads. This bothers me because I'm using the same amount of energy to do a medium load as a full load but I tell myself that I need to be certain it's okay. No funny noise. No walking, just clean clothes. I do a load a day but maybe that's better on my older washer than a gigantic load once a week. This episode and the evening with Pilchard and Mija chasing a mouse got me thinking about our use of language. 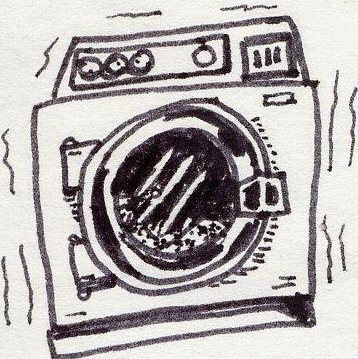 I thought about talking to some of my online friends about the washer. Maybe it was the belt. How would I describe what was going on? Easy. "It's making a 'funny' noise," I'd start with. What an interesting choice of word, 'funny'. We use this to describe the car, the washer, the copier at work, the toilet, the cats when they have a mouse, you name it. But when we use 'funny' in this manner it's not definition #1 - affording light mirth and laughter; seeking or intending to amuse. There's really nothing 'funny' about the 'funny' noise you're hearing. And yet, what would we do without such a descriptor. When I say, "The washing machine was making a 'funny' noise," we instantly know what I'm saying. I think it's even more descriptive than, "The washing machine was making a horrid noise." We all have, in our heads, an idea of what constitutes a 'funny' washing machine noise. It's generally not of the "it's gonna blow" variety. A "horrid" noise, however, instantly causes you to think the machine is in its death throes. But back to my household. The Jeep isn't making any funny noises, nor is the washing machine, nor have the cats, knock on wood. I would like, for the foreseeable future, for my noises to be of the "ha ha" variety and not the "oh dear, that doesn't sound good".